William Gaither "Billy" Crudup (/ˈkruːdəp/ born July 8, 1968) is an American actor. He is a four-time Tony Award nominee, winning once for his performance in Tom Stoppard's The Coast of Utopia in 2007. He has starred in numerous high-profile films, including Without Limits, Almost Famous, Big Fish, Mission: Impossible III, Watchmen, Public Enemies, Spotlight, Jackie, The Stanford Prison Experiment, Justice League, and Alien: Covenant, in both lead and supporting roles. He also starred in the Netflix original series Gypsy opposite Naomi Watts. He has been nominated for an Independent Spirit Award for Best Male Lead and a Screen Actors Guild Award. From 1998 to 2005, Crudup was the narrator for "Priceless", a U.S. television ad campaign for MasterCard. Crudup was born in Manhasset, New York. His parents, Georgann (née Gaither) and Thomas Henry Crudup III, divorced during his childhood, and later remarried, before divorcing a second time. On his father's side, he is a descendant of Congressman Josiah Crudup of North Carolina. His maternal grandfather was William Cotter "Billy" Gaither, Jr., a well-known Florida trial lawyer, and his maternal grandmother later remarried to Episcopal bishop James Duncan. Crudup has two brothers: Tommy, an executive producer, and Brooks, also a producer. He left New York with his family when he was about eight years old, first living in Texas, then in Florida. He graduated from Saint Thomas Aquinas High School in Fort Lauderdale, Florida in 1986. Crudup attended the University of North Carolina at Chapel Hill, where he received an undergraduate degree, and he continued his passion for acting with the undergraduate acting company, LAB! Theatre. He also acted for UNC-STV's most popular show, General College. He was a member of the Beta Chapter of Delta Kappa Epsilon. He then studied at New York University's Tisch School of the Arts graduate acting program, where he earned a Master of Fine Arts degree in 1994. Crudup began acting in films such as 1996's Sleepers, 1997's Inventing the Abbotts, and 1998's Without Limits, where he played the role of running legend and Olympian Steve Prefontaine. His first role in an animated feature was in 1999's English release of Princess Mononoke, in which he starred as Ashitaka. He then played Russell Hammond, the lead guitar player of the fictional band Stillwater in Cameron Crowe's Almost Famous (2000). In 2006's The Good Shepherd, he played British spy Arch Cummings, a stand-in for Kim Philby. The same year, he played a supporting role in Mission: Impossible III. In 2007, he played the leading role of Henry Roth in the film Dedication. Crudup completed filming Watchmen with director Zack Snyder in Vancouver, British Columbia. He portrayed the superhero Doctor Manhattan. He portrayed former U.S. Secretary of the Treasury Timothy Geithner in a TV film about 2008's financial crisis, Too Big to Fail (2011). A year after graduating, he made his debut on Broadway in the Lincoln Center Theater production of Tom Stoppard's Arcadia. He starred in The Metal Children, an off-Broadway play written and directed by Adam Rapp in 2010. In August 2013, he co-starred with Ian McKellen and Patrick Stewart in the Harold Pinter play No Man's Land as well as in Waiting for Godot at the Berkeley Repertory Theatre. The shows transferred to The Cort Theatre in New York City, where they ran in repertory until March 2014. In November 2017, he starred in the world premiere of David Cale's one-man play Harry Clarke at Vineyard Theatre. It moved to the Minetta Lane Theatre the following spring. From 1998 to 2005, Crudup was the narrator for the U.S. television ad campaign "Priceless" for MasterCard. In the ads, the narrator (Crudup) lists the prices of two goods or services, then lists some third, intangible benefit gained from those purchases and concludes, "priceless". He said in 2005 that appearing in the ads "changed my life", in that they gave him the financial freedom to pursue the acting work that he wanted to do. He appeared as Zartan in the 2009 parody video The Ballad of G.I. Joe on the website Funny or Die. From 1996 to November 2003, Crudup dated actress Mary-Louise Parker. Parker was seven months pregnant with their son, William Atticus Parker, when Crudup left her for actress Claire Danes, then 24 years old. Crudup was a decade older. The two broke up after dating for four years. ^ "Billy Crudup Biography". Yahoo! Movies. Retrieved 2008-05-21. ^ Evertz, Mary (2001-10-26). "Crudup family keeps busy in New York Series: PEOPLE". St. Petersburg Times. Retrieved 2010-05-19. ^ "The Miami News – Google News Archive". News.google.com. 1966-07-17. Retrieved 2012-06-22. 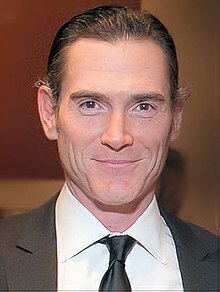 ^ "Billy Crudup Biography". filmreference. 2008. Retrieved 2008-05-21. ^ Jesse Green (10 October 2004). "Billy Crudup: Almost Infamous". The New York Times. Retrieved 2008-05-21. ^ "Miami Herald: News Archive". Nl.newsbank.com. 1997-04-03. Retrieved 2012-06-22. ^ Who's who in the South and Southwest – Marquis Who's Who, LLC – Google Books. Retrieved 2012-02-11 – via Google Books. ^ "2011 Tony Nominations Announced! THE BOOK OF MORMON Leads With 14!". Broadwayworld.com. Retrieved 2012-02-11. ^ Hill, Logan (May 30, 2005). "Free Billy". New York magazine. ^ Lee, Esther (November 10, 2015). "Mary-Louise Parker Finally Addresses Billy Crudup Leaving Her for Claire Danes During Her Pregnancy". Us Weekly. Retrieved August 3, 2018. ^ 20th Century Fox (22 February 2017). "Alien: Covenant – Prologue: Last Supper – 20th Century FOX" – via YouTube.